Stitching slows down in the summer as the weeds grow faster, but I did finish a new design and I stitched a few chocolates from the Box of Delights SAL too. In the summer I’m busy outside, taking advantage of the sunshine to walk and play with the dogs and visit with the horses. I’ve flower beds and a small orchard of Haskap Berry, (or Honeyberry) bushes to tend. We have a short growing season, and the weeds grow fast and furious to make best use of it. I’m kept busy digging encroaching grass, dandelions and pig-weed; I don’t use chemicals for weed control. 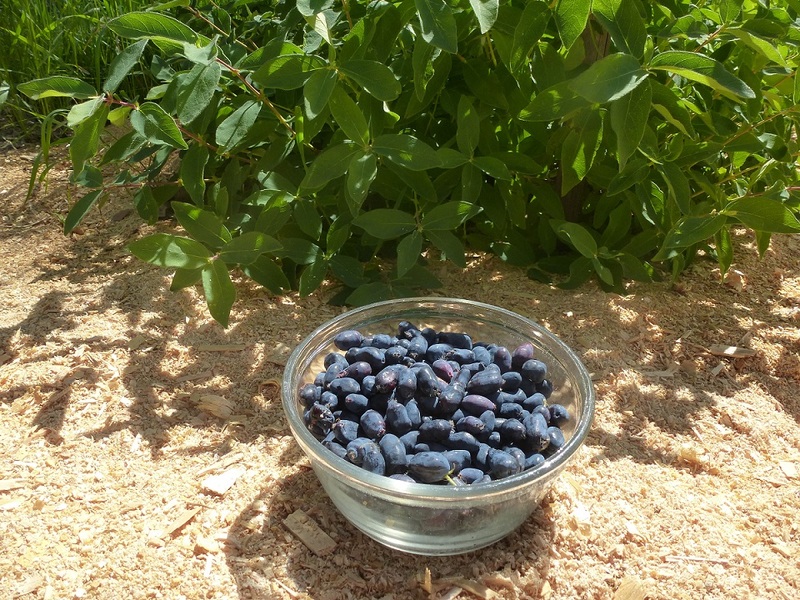 The Haskap bushes are 3 years old, not yet mature, but I’ve picked enough berries for a couple of pies and there are still a few more ripening on the bushes. I’ve picked a few too soon, before they were quite ripe and they are very tangy, almost sour. The ripe berries are yummy, juicy and sweet and they remind me of a Saskatoon – but without the seeds! 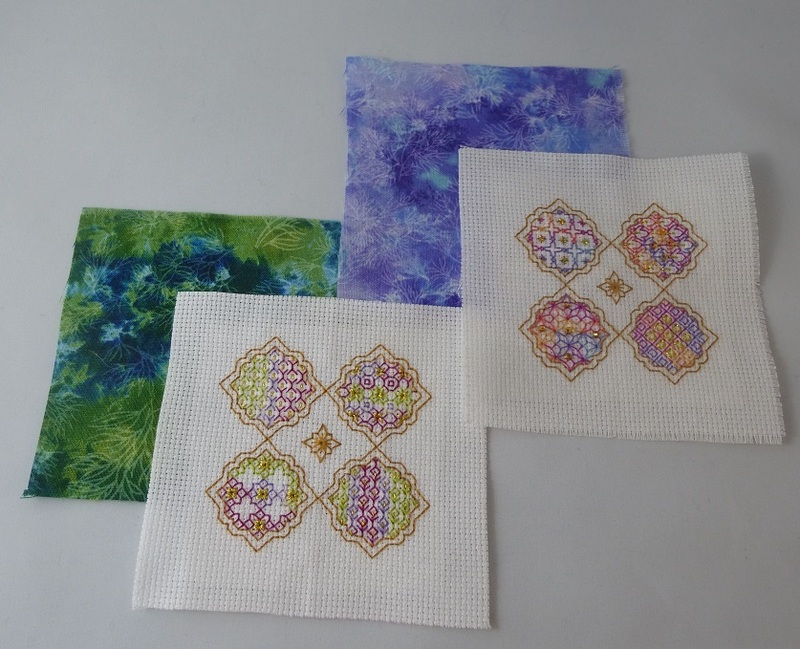 I stitched some of the chocolates from blocks 3 and 4 with Fiberlicious’ “Court Jester” and “Hawaiian Sunset”. 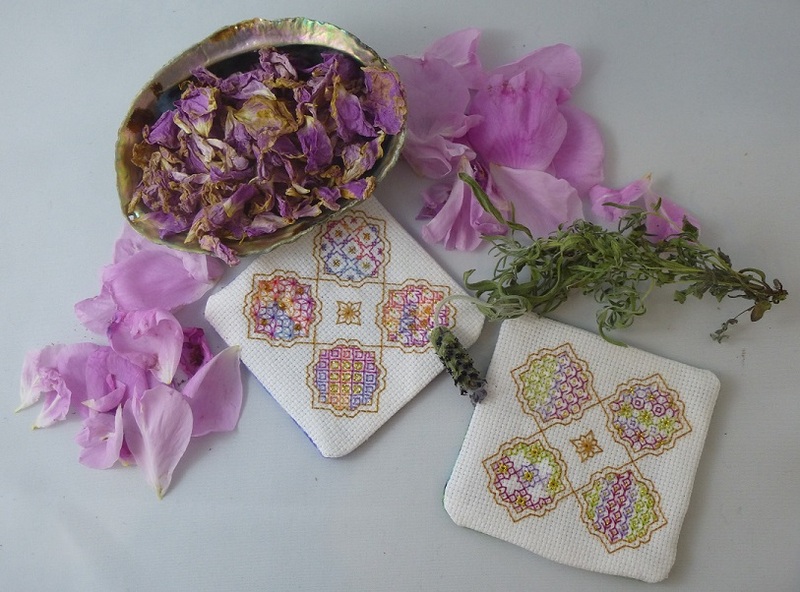 The roses and lavender in my flower garden smell so sweet, and I thought it would be nice to dry some for sachets. I attached a small piece of material to the back of my stitching, with iron-on fusible web so that the dried flowers stay in the sachet. Then sewed a piece of fabric to the back of my stitching to create a little sachet. I’ve left an opening so I can pour in the flowers when they finish drying. 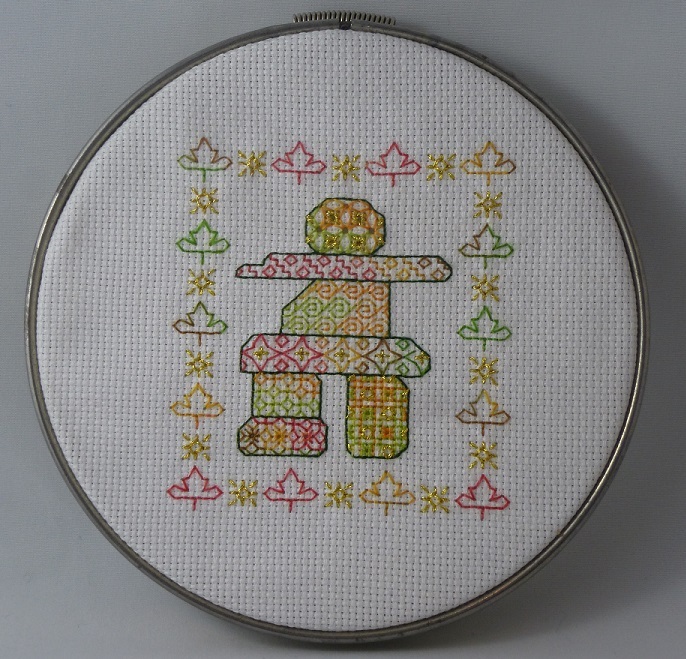 My newest blackwork design is an Inuksuk, for Canada Day. Inuksuit are created by the people of the Arctic to mark a place of importance. In Canada, Inuksuit are found in the northern Territories of Yukon and Nunavut and have come to represent Friendship and Welcome. This Inuksuk is surrounded by maple leaves, the iconic symbol of Canada, and shining suns representing the land of the midnight sun. He is stitched in warm autumn colours – Flamboyant Fall and Apple Harvest – with glimmers of Arctic gold. 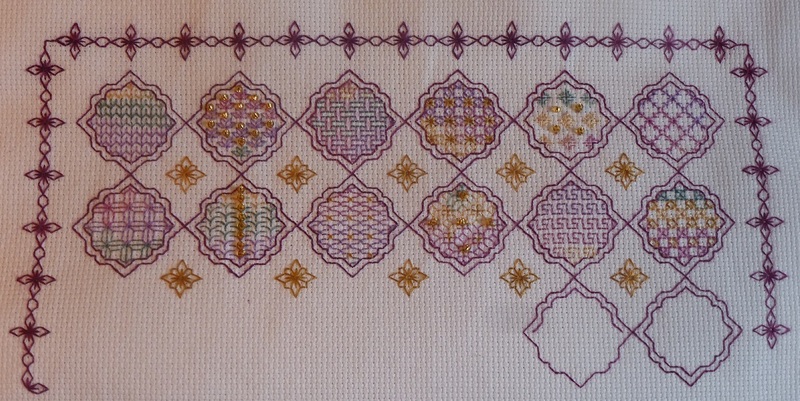 The pattern is 50 x 59 stitches – on 18ct that’s 2.75 x 3.25 inches, a nice size for a small hoop, or a card. And now I’m off to enjoy some more country air and sunshine… and maybe pull a couple of more weeds! am a Canadian farm girl from the interior of beautiful British Columbia. My mom taught me how to cross-stitch almost 30 years ago, it's always been one of my favorite pastimes. Then I discovered blackwork and fell in love with the intricate, lacy patterns. I started designing patterns as gifts for my friends and family. Whenever I have a free moment, I am either designing or stitching, with a Lab and a Corgi or three curled up nearby. Art, Design and Life on the Cumbrian Mountains.